Cassini flew within 436 kilometers of Enceladus' surface today. Although it's Cassini's 11th targeted flyby of Enceladus, these close buzzes are never routine. Unlike last month's close encounter, which was devoted entirely to radio science, time was set aside on this one for imaging. The full details on what images were planned for when are available on the imaging team's "Looking Ahead" article for rev 131. 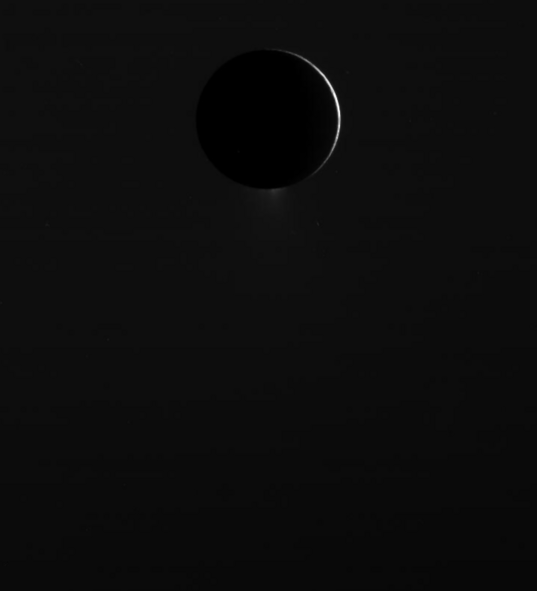 On approach Cassini got a terrific shot of a barely-lit crescent Enceladus, with those south polar plumes going strong as always. Cassini captured this view of Enceladus and its ever-active south polar plumes as it approached for its May 18, 2010 close encounter with the moon. 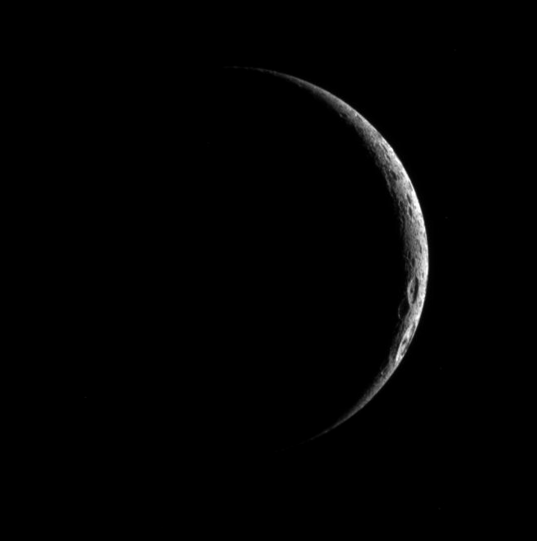 But Enceladus wasn't the only moon looking pretty as a crescent to Cassini; the spacecraft turned away for long enough to take a gorgeous image of a crescent Dione. This unusually high-phase view of Dione was captured by Cassini just before its close encounter with Enceladus on May 18, 2010. I love the way the light picks out the shapes of the craters on that barely sunlit bit of icy moon. These photos weren't taken just to be pretty; Cassini is trying to determine whether Dione, with its apparently fresh icy cracks, has some kind of plume-like activity like its little sibling Enceladus. To that end, Cassini took numerous images with much longer exposures. These saturated the sunlit crescent, while revealing details on Dione's nightside faintly lit by Saturnshine. What Cassini's really looking for are faint plumes off the edge of Dione's disk. Before you spend any time searching, I'll tell you the versions of the images that are sent to the Web are (because of the way they are compressed) of no use for finding such plumes, if they exist. Leave that work to the science team -- until these data hit the official archives in about a year. 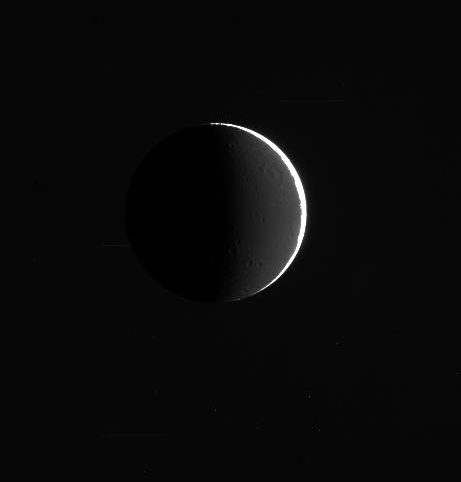 With the Sun nearly behind Dione, half of its night side is faintly illuminated by reflected light from Saturn. The photo was taken by Cassini on May 18, 2010. 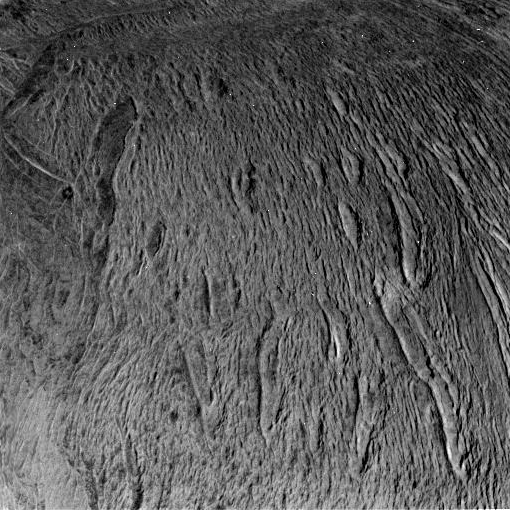 Enough Dione; there's much more to be seen in the cool images from the close Enceladus encouter! Here's just one. It's such a strange landscape, to me, because there are no craters to be seen anywhere. That's a very, very youthful surface, changing, probably, as you read this! Even cooler, that image was captured by a spacecraft less than 24 hours ago. You're seeing brand new images from deep, deep space almost as soon as they were taken. Awesome. There's lots more weird terrain on display at the raw images website; check the Looking Ahead page for a diagram of how the different photos should fit together to make a map of most of the visible hemisphere of Enceladus.